Do you like the mountains? Then you should know that in Italy you can find many huts located 3000 meters above the sea level. So, let’s see three of the highest Italian huts you can visit. Capanna Margherita is the highest hut you can find in Italy – and in Europe. It’s located in Piedmont, on Monte Rosa, at an altitude of 4,554 meters. 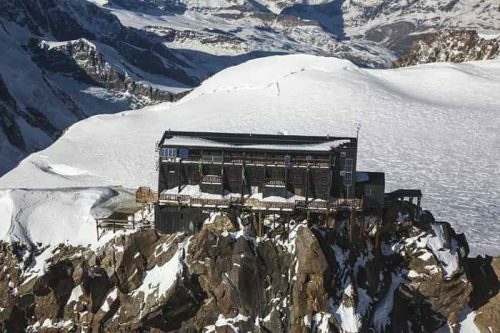 The construction of the hut was directed by The Italian Alpine Club in 1889 and dedicated to the queen of Italy Margherita of Savoy. The hut was pre-built in the valley and then was brought to its actual location by men and mules. Once there it was assembled. Capanna Margherita was officially opened the 18th of August 1893 in the presence of Margherita of Savoy herself. The hut became a research center for high-elevation medicine and a meteorological station. In 1977 Capanna Margherita was completely restored. It’s now open from June to September and can accommodate 70 people. Since summer 2017 civil marriages can even be performed within Capanna Margherita – just in case you’re thinking about marrying in a very special location. But be warned: you can’t reach Capanna Margherita by elicopter. You’ll have to walk to get to it. The traditional trail starts from Alagna Valsesia. The majority of people take two days to get to Capanna Margherita since they stop for some rest at Capanna Gnifetti. Needless to say that to get to Capanna Margherita you should have a good physical preparation and a good knowledge of alpine techniques. Also rifugio Quintino Sella is one of the highest Italian huts. It’s located in Gressoney-La-Trinité, in Valle d’Aosta, at an altitude of 3585 meters. The first hut was built in 1885 and it was then rebuilt in 1907 and also in 1924. The actual building was finished in 1982. Rifugio Quintino Sella is really close to Felik glacier and can host up to 142 people. It’s usually open from June to September but it’s always better to check before going there. You can reach rifugio Quintino Sella from different paths. The most popular path is the one starting from Gressoney-La-Trinitè. From there it will take you 3 or 4 hours to get to the hut. Capanna Punta Penia is one of the highest Italian huts. It’s located on the summit of the Marmolada, in Trentino, at an altitude of 3,343 meters. It was built in the ‘40’s by Giovanni Brunner, a mountain guide, starting from a military garrison dating back to the first world war. The hut is run by the family Soraruf. It’s open from June to September and offers six beds. As you can easily imagine, it’s not easy to get to Capanna Punta Penia too. From passo Fedaia it’ll take you from 3,30 to 4 hours to get to Capanna Punta Penia. Even in this case you should have a good physical preparation and a good knowledge of alpine techniques. Have you ever been in one of these three Italian huts? Italy, tourism, visit Italy. Bookmark.